Richie Martin's 4-for-4 night at the plate helped back Parker Dunshee's brilliant seven-inning start as the RockHounds won their third straight, defeating the San Antonio Missions, 5-2, Thursday evening at Security Bank Ballpark. Dunshee, who did not allow a hit in his last start (seven-and-a-third innings on August 24 at Corpus Christi) tossed seven scoreless innings in the win, scattering six hits while walking one batter and striking out six. With his second consecutive quality start (see below), the right-hander claimed his seventh win (7-4) and lowered his ERA to 2.01. Martin ripped two doubles and a triple, scored one run and drove in another (and stole his team-high 24th base), scoring the game's first run on Nate Mondou's single in the second inning. Sean Murphy and Luis Barrera each had an RBI double in a three-run third inning with Martin's RBI single pushing the lead to 4-0. Seth Brown's 14th home run (and his 86th RBI, second in the Texas League) capped the scoring. After San Antonio broke up the shutout bid with a pair of runs in the eighth, Kyle Finnegan slammed the door with a 1-2-3 ninth, two of the outs coming on strikeouts, earning his 12th save in as many opportunities. The RockHounds are the league's hottest club, now 13-4 over their last 17 games. Thursday's win over San Antonio also clinched the (four-game) series, giving the 'Hounds their fifth consecutive series victory. 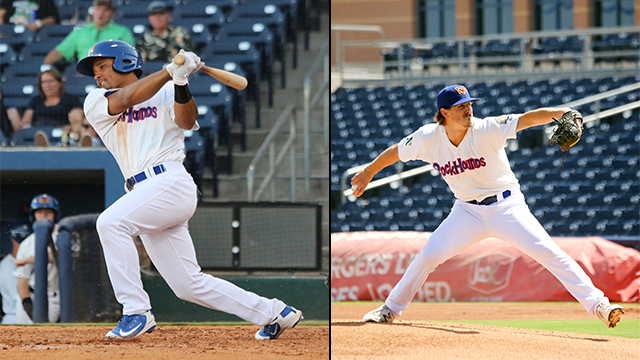 Eli White and Jesus Luzardo have been named to the 2018 Texas League Postseason All-Star Team (the league announced the selections late Thursday afternoon). Eli currently ranks second in the batting race (.306) and leads the league on-base percentage (.389), in triples (8) and runs scored (80). Jesus, rated the Oakland A's # 1 prospect, was 7-3, with a 2.29 ERA in 16 starts for the RockHounds with a 0.97 WHIP and a .204 opponent average. The left-hander, now with (AAA) Nashville, struck out 86 batters while walking just 18 in 78.2 IP. The end of season All-Star Team is a tremendous achievement. Congratulations, Eli & Jesus! Friday night's game will be the last-ever meeting between the Missions and the (Cubs, Angels) and RockHounds, as San Antonio's franchise is moving to the (Triple-A) Pacific Coast League in 2019. The final game will bring the regular season total to 1,444 (since 1972), making it the most prolific rivalry in the Texas League's 130-year history. In his last two starts, Parker Dunshee has gone fourteen-and-a-third scoreless innings, allowing six hits and three walks with 13 strikeouts. Tyler Ramirez has hit in 24-of-28 games (.339) with 19 RBI and has reached base in 30-of-34 (.326) with 26 RBI. He ranks third in the Texas League with 78 RBI. Richie Martin has hit in 11-of-12 games (.385) with three doubles, two triples, three home runs, nine runs scored and 10 RBI. He is slugging .795 over the 11 games, with six walks (.457 OBP) and nine strikeouts and three stolen bases in five attempts. J.P. Sportman has hit in 11-of-12 games (.292) with two doubles, three home runs and nine RBI. Nate Mondou has hit in five straight games, going 6-for-16 and adding two walks (on-base in 8-of-18) and a stolen base. In the top of the eighth inning on RockHounds Radio I mistook strike two for strike three, apparently trying to "ring up" Josh Naylor on a 1-1 pitch. Apparently, it was contagious. Moments later, right fielder J.P. Sportman caught Kyle Overstreet's fly ball and, thinking it was the third out, tossed the ball to a fan in the stands. Had the bases been empty, no problem, but Buddy Reed was at second base at the time and jogged home on the play (which goes as a throwing error). Richie Martin filled out the stat sheet in more ways than one Thursday, going 4-for-4 with two doubles and a triple, scoring one run and driving in another, adding a stolen base and a caught stealing. Two of outs came via rundowns, on which a total of nine players touched the ball. Outfielder Luis Barrera has been activated from the disabled list and was in the lineup Thursday night. Luis, who had been sidelined since August 22 (finger), went 1-for-4, with an RBI double and a run scored in his return. His tremendous throw from center field to third baseman Nate Mondou for an 8-5 double play erased a leadoff double and was the game's most significant defensive play. Luis is hitting .328 in 33 games since being promoted to the RockHounds from (Advanced-A) Stockton in mid-July.